Five INLD members of the outgoing Haryana Assembly, including Town and Country Planning Minister and former President of Lok Dal, Mr Dhirpal Singh, were today expelled from the party for “anti-party activities” during the recently held assembly elections. Voters have elected four new faces to the assembly from the district. Mr Dura Ram of the Congress from Fatehabad, Mr Kulbir Beniwal (Cong) from Bhattu Kalan, Mr Paramveer Singh (Cong) from Tohana and Mr Gian Chand Odh of the Indian National Lok Dal from Rattia (Reserved) are all the first-time entrants to the assembly. As many as 54 candidates out of 73 candidates who contested the Assembly elections from six segments, Baroda (R), Gohana, Kailana, Sonepat, Rai and Rohat, had lost their deposits. The Haryana Chamber of Commerce and Industry, while hailing the Budget- 2005 as being growth-oriented, has lamented that it offers little for the small-scale industry. Discussing the provisions of the Budget announced by Finance Minister, the Haryana Chamber said Mr Chidambaram had put the small-scale industry on par with the medium and large-scale industry. Five railway personnel sustained injuries during a fracas at the annual general meeting of the Northern Railway Men’s Union (NRMU) held at the Ambala Cantt railway station this morning. The incident took place when a section of NRMU members, who had earlier alleged irregularities in the union fund, reached the venue of the meeting. A group of Australian nationals are cycling across Haryana to raise awareness about female foeticide. “Bike for Bibles : Caring for the girl child” is the objective of the group. The Bar Council of India (BCI) has finally recognised the Department of Laws at the Chaudhary Devi Lal University (CDLU) here. The BCI has also allowed the university to double the strength of the department. The marriage of 57 couples was solemnised at a mass marriage ceremony on the premises of Shri Sangmeshwar Dhaam, Urnai, Pehowa, 25 km from here, last evening. One person was killed, and several others were injured when a marriage party was attacked in the Mahabir Colony locality here last night. According to police sources, the baraat of Sunil, a resident of Surya Nagar, had gone to the house of Mr Murari Lal of Mahabir Colony. One person was killed and four others were injured when the car in which they were travelling rammed into a tractor-trailer near the truck union chowk on the national highway late last evening. One person was killed and two others were injured when a goods train rammed into a tanker at Ismaila level crossing, about 25 km from here, late this evening. Dhirpal Singh, who had won five assembly elections from his Badli constituency, did not contest this time on the INLD ticket citing health reasons. It is believed that he did not approve of the INLD candidate who was chosen by the party chief, Mr Om Prakash Chautala to replace him at Badli. The expelled INLD leader, known for his good manners and precise arguments in the assembly, could not be contacted for his comments despite repeated attempts. Four other legislators, who have been expelled from the party, are Mr Rambir Singh, Mr Banta Ram, Mr Jarnail Singh and Mr Shashi Ranjan Parmar. None of them were given INLD tickets. Mr Rambir Singh was INLD legislator from Pataudi (SC) seat, Mr Banta Ram was INLD representative from Radour, Mr Jarnail Singh from Ratia and Mr Shashi Ranjan Parmar from Mundhal Khurd. While the Badli seat was bagged by an Independent candidate in the elections held on February 3, Pataudi and Mundhal Khurd went to Congress and Ratia and Radaur seats were retained by the INLD. Other than the five MLAs, 11 party functionaries were also expelled from the party today for anti-party activities. They are Mr Ajmer Singh, Convener of the INLD’s farmers cell, Mr Ram Bhaj, State Secretary, Mr Jhajju Ram, State Secretary, Mr Bed Singh Malik, member of the State Executive, Mr Raj Singh Dahiya, Chairman of the Sonepat District Council, Mr Daya Nand, constituency unit President of Safidon, Mr Baldev Singh, constituency unit President of Ratia, Mr Pradeep Aggarwal of Yamunanagar, Mr Roshan Dhanda of Pai constituency, Mr Bhagat Ram Kapur of Yamunanagar and Mr Hukam Singh, former MLA. Mr Dura Ram is a nephew of the Haryana Pardesh Congress Committee President, Mr Bhajan Lal. He contested the May, 2003 byelection from Fatehabad, but was defeated by Mrs Swatantar Bala Chaudhary of the Indian National Lok Dal. However, he defeated Mrs Chaudhary this time by a margin of 10,625 votes. Mr Kulbir Beniwal from Bhattu Kalan fought the first election and humbled the Finance Minister, Mr Sampat Singh. Mr Beniwal is a close associate of Mr Bhajan Lal’s son, Mr Kuldip Bishnoi, and had surprised many when he got the party ticket. Mr Paramveer Singh, the newly elected MLA from Tohana, is a son of senior Congress leader, Mr Harpal Singh. He contested the 2000 assembly elections for the first time but lost to Mr Nishan Singh of the INLD. Mr Paramveer Singh avenged his defeat this time by defeating Mr Nishan Singh by a margin of 18,783 votes. Mr Gian Chand Odh, the newly elected INLD MLA from Rattia, was aspirant for the Congress ticket till the Congress MP from Sirsa, Mr Atma Singh Gill, got the ticket for his son, Mr Gurdeep Singh Gill. Mr Odh switched loyalty in a day and jumped in the fray with the INLD ticket. Another aspirant for the Congress ticket, Mr Mangat Ram Lalwas, also jumped in the fray as an Independent. Mr Odh defeated Mr Gill with a margin of 10,051 votes in the triangular contest that ensued. According to a report, they include Bahujan Samaj Party six, BJP four, Janata Dal (S) four, Nationalist Congress Party two, Lok Jan Shakti Party three, CPI one, Samajik Ekta Party one, Rashtriya Lok Dal one, JJJKM one, SEP one and the remaining are independents. The Congress candidates, Mr Anil Thakkar, Mr Jatinder Singh Malik, Mr Ramesh Chander Kaushik and Mr Dharampal Singh Malik had won from Sonepat, Kailana, Rai and Gohana constituencies. Mr Sukhbir Singh Farmana of the NCP had won the Rohat constituency and Mr Ajit of the INLD had won the Baroda (R) Assembly constituency. Mr Dev Raj Dewan, who contested the election on the NCP ticket from Sonepat Assembly constituency, had been defeated. He got only 9,518 votes and lost his security deposit. Mr Satinder Kumar Nandal, INLD candidate, who got 20,898 votes, bagged the third position, The BJP candidate, Mr Lalit Batra, who got 8,309 votes, lost his security deposit. The Haryana Chamber of Commerce and Industry, while hailing the Budget-2005 as being growth-oriented, has lamented that it offers little for the small-scale industry. Discussing the provisions of the Budget announced by Finance Minister, the Haryana Chamber said Mr Chidambaram had put the small-scale industry on par with the medium and large-scale industry. Mr Satish Gupta, president of the HCCI, said though sops had been announced for sugar, textile and oilseed industry, the small-scale industry would be hit hard by the budgetary provisions. ‘‘The excise duty hike on steel will have an adverse affect on small-scale industry, where steel is a major component. The hike in steel and cement prices will also affect the housing sector,’’ he said. Mr C B Goel, former president of the HCCI, said 4 per cent hike in the excise duty on steel would also affect the auto industry, which is the second largest growing industry after the service sector. ‘‘Though the Budget aimed at luring the rural sector and farming community, the hike in steel prices will further lead to an increase in prices of agricultural implements and tractors,’’ he said. Mr Vinod Kapoor said that the decision of imposing Rs 10 tax on every cash transaction of Rs 10,000, was a big blow and a retrogate step. The members said though the reduction in the customs duty on selected capital goods and their parts was good news for the large-scale industry, it would be a blow for the domestic industry manufacturing these goods. Mr Vishnu Goyal, general secretary of HCCI, hailed the decision to raise ceiling for small-scale industry exemption based on turnover from Rs 3 crore per year to Rs 4 crore per year. He said that the decision to raise the income tax limit to Rs 1 lakh across the board was also a good step. Five railway personnel sustained injuries during a fracas at the annual general meeting of the Northern Railway Men’s Union (NRMU) held at the Ambala Cantt railway station this morning. The incident took place when a section of NRMU members, who had earlier alleged irregularities in the union fund, reached the venue of the meeting. As soon as they tried to get onto the stage to meet the general secretary of the All India Railway Men’s Federation, Mr J.P. Choubey, they were assaulted by a group of railway union members. About six NRMU members were badly beaten up. Two of them, Mr Vinod Vatrana and Mr Nawazish Raza, mainly bore the brunt of the attack. Those injured were later taken to the Civil Hospital. Mr Vinod Vatrana, who was injured in the attack, alleged that the NRMU divisional secretary, Mr C.S. Bajwa, was responsible for the incident. “We had exposed the irregularities in the union funds. We had also questioned the manner in which a luxury car was bought by Mr Bajwa through union funds. This incident is the result of blowing the lid off irregularities,” he said. He said that no proper election had been held and for the past many years, the election was taking place through the show of hands. “We had demanded that there should be secret ballot so that the truth emerges,” he said. At the Civil Hospital, the associates of the injured railway personnel raised slogans against the police and the hospital administration. They claimed that the police was not taking the incident seriously and the doctors were also not giving proper medication. Earlier while talking to mediapersons, Mr Choubey demanded that the government must immediately implement the 6th pay commission. “We have given the government a deadline of three months, which will be over on May 17. If the government does not accede to our demand then the only option left for us is going to be strike,” he said. He said that going on strike was the last option for them. “We do not want any political instability. We just want that our just demands must be met by the government,” he stressed. Mr Choubey said that some of the announcements in the rail budget were a welcome step. “Earlier, the Railway Recruitment Board had been given the task of filling Group `D’ posts, which was totally unnecessary. This had led to several posts lying vacant. Now, the group D recruitment will take place at the local level,” he said. He pointed out that due to the earlier issue, nearly 1.26 lakh Group D and Group `C’ posts were lying vacant in the Indian Railways. Mr Choubey stated that railway accommodation were in a bad shape due to lack of proper maintenance. “We had time and again raised this issue. Now, a 10-year period has been decided upon for deliberation and finalisation of a proper policy in this regard,” he said. A group of Australian nationals are cycling across Haryana to raise awareness about female foeticide. “Bike for Bibles : Caring for the girl child” is the objective of the group. The group, which reached Ambala last night, was flagged off by Philadelphia Hospital Director, Dr Sunil Sadiq today. The cyclists left for Chandigarh. “While the Bible Society celebrates its 200th anniversary, we did not want to let the decade of the girl child go by without doing our little bit, to highlight the issue. 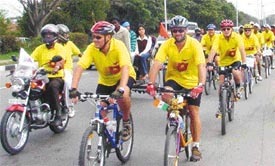 Cycling is part of our annual feature and what better to do while cycling across Haryana to Punjab than to dedicate the ride to spread awareness on the issue of girl child,” a note issued by the Australian group stated. They said to spread awareness of such an issue is a matter of privilege and pride for the Bible Society of India because the Bible upholds the rights of woman and child as sacrosanct. “The Bible records in its sacred pages, women of courage and conviction. Even the birth of the Bible Society movement can be traced back to the unwavering desire of a little young girl who wanted to possess a Bible of her own,” the note states. Talking to the The Tribune, the Registrar, Dr Ajay Kumar Rajan, said the university planned to start a five-year LLB programme from the next academic session. He said the BCI had granted permission to the CDLU in this regard. A communication in this regard was received yesterday, said Dr Rajan. The BCI also wrote to the university authorities to appoint five full-time teachers and upgrade the library. At present, there were 65 students in the three-year LLB course, but from the next academic session, the university was keen to admit 130 students, as permitted by the council. The BCI also granted permission to the university to start a five-year LLB course with a strength of 120 students from the next academic session. Eligibility for the programme would be Class XII. The ceremony was jointly organised by the Shri Panchayati Akhara Mahanirvani, Akhil Bhartiya Shri Sangmeshwar Sewa Dal, and Shri Durga Sewa Dal, Sangrur. While 53 couples were married according to Hindu rituals, two Sikh and two Muslim couples were married according to their rituals. According to Mahant Gangapuri, secretary, Shri Panchayati Akhara Mahanirvani, and manager, Shri Sangmeshwar Dhaam, Urnai, each of the newly wed was given household articles like utensils, furniture and a bicycle worth around Rs 2,300. Also Rs 1,100 in cash was also given to each of the newly married couples on behalf of MP Naveen Jindal. Students of Baba Sharwan Nath Senior Model School and Baba Sharwan Nath Senior Secondary School presented a colourful programme. Mr Vijay Chopra, Editor-in-Chief, Hind Samachar Group of Newspapers, Jalandhar, Mr Jai Kishan Aggarwal, an industrialist, and Mahant Banshipuri of Shakti Peeth, Pehowa, were among those who were present. Talking about Shivratri celebrations, Mahant Gangapuri said a shobha yatra would be organised at Pehowa on March 3, while a blood donation camp would be held on the Shri Sangmeshwar Dhaam premises on March 8. On their arrival, the marriage party was received at a school near Mr Lal’s house. There some youths of a nearby locality allegedly gate-crashed into the party. Members of the marriage party made them leave the scene. However, when the baraatis set off for the bride’s house, they were attacked by a group of youths armed with swords and lathis. Groom’s uncle Sattan Singh was hacked to death, while several others received injuries in the attack. The police has registered a case in this regard. The deceased has been identified as Gulshan Kumar, a resident of Panipat. Those injured were identified as Amit Kumar, Sumit Kumar, Dinesh Kumar and Pradip Kumar, all residents of Panipat. The injured were rushed to the local Civil Hospital for treatment. The police has registered a case. According to eyewitnesses, the driver of the tanker tried to cross the track even as the train was approaching. However, his vehicle was hit right in the middle of the track. The driver died on the spot. There were no injuries to any of the train crew. Traffic on the track was disrupted. The Haryana Governor, Mr A.R. Kidwai, today prorogued the Haryana Vidhan Sabha in exercise of the powers conferred upon him by virtue of sub clause (a) of clause (2) of Article 174 of the Constitution of India. This was stated in a press release issued here today.